With the many different brands and models extending from the running footwear space, it is often difficult to find great differentiators between products. Similar features and material make up set a tone for the discussion, often ending with the user choosing the most budget-friendly options. To find success in this space, you have to introduce new technology and defined features. This is where the Altra Instinct 3.0 excels. The product inclusions take a deeper look into the needs and tendencies of runners, ensuring the model meets the proper standards. Below, we will define these features and explain their functions in terms of usage. We breakdown the shoe piece by piece, ensuring a full review of the elements that make up this model. Piggy-backing off the Instinct 2.0, this new production model holds some features that have us raving. The weight reduction makes for a fascinating piece since material usage was not scaled back. Altra continues to emit the proper design functions and their proprietary means of comfort and support find their proper space. We love the redesigned outsole and the inclusions of the InnerFlex technology at the midsole and insole regions. This company continues to pack their models with features and elements that build upon our concerns. The only area that could use a little more attention is the upper, but this is a minimal compared to the maximum potential this shoe hosts. Check Price on Amazon! 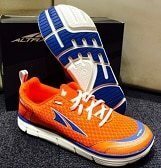 Altra has been busy in terms of product development. Their product lines expand to the running and casual space, with a heavy focus on the athletic footwear space. This 3rd installment in the Instinct product line introduces new upgrades and revamps existing features. The new features revolve around holding technique and better coverage in terms of comfort and stability. The new holding technique is introduced through the outer shell of the shoe. The fabric and synthetic materials close in on the foot, emitting more pressure on the foot. Usually pressure is a negative feature, but this concern is addressed internally. The shoe features total padding coverage that is located directly underneath the shell. Holding techniques are most common in the upper portion of the shoe, with inclusions to the midfoot and toe box area being an added bonus for the user. Stability is increased through the redesigned outsole. The outsole is made of rubberized materials. The new feature is the cuts being placed into the outsole. This spaces out the support mechanisms and works to provide better responsiveness from the user. Shoe responsiveness is an area that is underappreciated in the running footwear space. 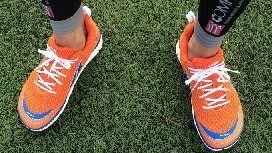 We all have different stride lengths and we all apply differing running strategies, leaving our footwear to make up for areas where we may be weak. This responsive design helps cater to your running style, emitting the proper shock absorption and power amounts when needed. The spacing of the cut outsole covers all areas of pressure, ensuring your running pattern won't be too difficult for this shoe to conquer. Sizing the shoe to your foot is the most important piece of the selection process. Brands will often change their constructions, causing for some headache with comparison. If your foot is designed to fit a prescribed length, go with that size. This model runs true to size in length, but the width is the area that needs to be addressed. Going up by half a size should compromise for the new design. If you are unsure, utilize the previous models as a starting point. The Instinct 2.0 runs a little smaller than this model, representing a half size increase for the user. Prescribing the right fit can be accomplished through testing out this brand. The best advice would be to upgrade by half a size because the increase in holding techniques will make up for any of the extra length the shoe may have. The outsole represents a key area of support for the user. It is made up of rubberized materials and sits about an inch off the ground. The undercarriage increases the intrigue factor with a mapping technique that targets the main tendons and bones of the foot. There are patterned extensions that grip to the ground, providing for increased stability and traction. These extensions target the main areas of the foot, ensuring that pressure emissions are of the low-impact variety. This also creates for the ability of the user to apply their own running strides and patterns. The user isn't forced into a prescribed movement, allowing a free-flowing stream of running ease. The midsole features some of the new product additions exclusive to this third installment. Groove implementation occurs at the midsole and extends from the front of the shoe to the back. This is called InnerFlex technology. This technology allows your foot to respond to movement in a natural sense. Forcing your pattern can also change your area of focus, reducing the mental fitness aspect. This area helps the foot flex naturally, keeping a positive flow of movement and enhancing your focus. This can also lead to speed increases for those looking to improve upon their personal records. The upper works to apply lightweight stability and reduce the wear and tear caused by nature. The fabric and synthetic build allows for the lightweight title. The combination of these two forces creates a positive source of strength and reinforcement. The upper takes an obscure shape at the insertion point, creating for a roomy fit. This allows the user to fit the shoe with ease and tighten to their likeness. The material properties in this area also creates a weather resistant shield. These materials do not absorb liquid, hosting a water-resistant title. If torrential rainfall down pours during your run, have little fear as these materials dry quickly and efficiently. The weight of the shoe creates some excitement surrounding the brand. 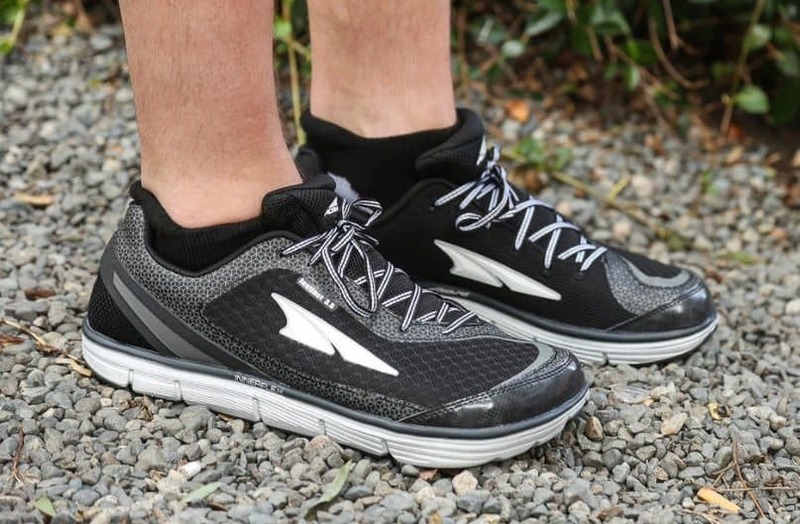 Previous Altra models have come in at the 9-ounce mark with consistency. The material usage isn't decreased, but the placement occurs at a more even-keel. This sound construction has brought the total weight of the shoe to 8.1 ounces. This makes this model one of the most lightweight selections across the running marketplace. There is no sacrifice for excellence, as the features will detail. The weight component is a pleasant surprise for users and this weightless nature makes it a great fit for any type of runner. Breathability is another shoe component that should be addressed in some form. The first instance of inclusion that meets these needs occurs at the insertion point. The insertion point is widened, and features drop off at the sides of the shoe. This allows for easy access for the foot and air flow. Air can flow throughout this area, keeping the foot from overheating. The materials used are also very light and thin, creating another instance where air flow can penetrate the shoe. Small dimples placed across the outer shell help influence this air movement. The holes remain small to ensure weather elements do not impact the foot or clog down the shoe. Comfort is delivered throughout all areas of the shoe. The components spelling the outsole and midsole area have already been discussed, switching the attention to the insole area. A-Bound technology is introduced at the inner housing of the shoe. This helps promote spring, giving you the most acceleration from your push-off. This also creates applied means of comfort. The insert is patterned to cater to the areas of the foot that emit the most activity. This includes the toes, arch, and heel. This insert forms to these areas, possessing the capabilities of a memory foam. If the insert takes up too much space, it can be removed to increase space in the toe box and heel area. This allows you to create your own form of comfort, never having to compensate for applied means. Durability often comes into question when considering the materials used to make a shoe. Synthetic and mesh materials are often criticized for being thin. While these materials may be thin, they are fused in the correct fashion. The outsole creates for the strong base and is the starting point for durability building. The midsole sits tight to the outsole, reducing the threat of material separation. The materials feature additional stitching patterns to ensure a strong build. The back-heel area also implements the use of a cupping mechanism that wraps around the entire upper area of the shoe. This reduces cave-in and other material wear and tear. These shoes dry off quickly, which makes a case for their strength by conquering forces of nature. The thick outsole represents a fitting base for conquering adverse surfaces. The cuts place on the outsole also creates for stability means on uneven surfacing. This makes any terrain fair game. The optimal usage is intended for flat and smooth surfaces, combining the produce all prescribed benefit means mentioned previously. Rocky surfaces can produce tread wear over time, marking this surface as a potential durability threat. Venture off-road for a little trail running represents a test these shoes are willing to stand up to. Stability introduction starts at the outsole. The design utilized keeps the bottom of the shoe relatively flat and even to the ground. There are few lift components that are not met with a partnered piece, making these shoes relatively stable. Stability is also introduced at the insole. The insert technology keeps the foot sitting relatively flat. This reduces discomfort and allows the user to apply their own versions of push-off, stride length, and other such running intensive capabilities. The design keeps all features even-keeled, making the shoe stable in many different facets. The synthetic and mesh elements when matched with the rubberized outsole, creates for a give and take flexibility method. There is much give in the upper shell, with the outsole producing the most resistance. This is a common format when developing sound flexibility techniques. The front of the shoe offers enough bend and give to cater to the short stride types. The back is reinforced, creating little give from the ankle and heel area. There is also proprietary means at-use that allow for flex from the internal standpoint. Overall, the flexibility of the shoe is on-point with other comparable running shoes. Prescribing additional usage for shoes that are designed for running can be difficult. Since the defined activity is running, this marks for the best area of use. This fails to account for everyday wear. The outsole support is very think and offers responsive technology that directly stems from your movement. This responsivity is termed for all terms of movement, including walking. These two features combine to make this a proper fit for everyday use. There are enough included support elements to make a case for this shoe being a good fit for those who spend a majority of their day on their feet. Hot climate work is not match for the breathability technology, making this the perfect partner for the outdoor work space. The Altra product line spans a wide horizon when it comes to running shoes. The Torin 3 runners hold a similar build to that of the Altra Instinct 3.0 shoes. Their build extends from the textile and synthetic space. The design takes a more reinforced approach, providing additional padding and strength measures. This causes the weight of this shoe to go beyond the 9-ounce mark. The outsole is designed with a similar build, but the back of the outsole creates an incline at the heal. This makes the Torin 3 a better fit for short distance runners or walkers. The increase in back support bodes well for these mentioned activities. The Superior 3 is designed for the off-road runner. Extending from the outsole at the undercarriage are thick rubber grippers. These gripes are angled and spaced to produce the proper holding technique on any surface. Their design is also rugged, giving these shoes the look to match the part. They are designed of textile materials and have a relatively low weight calculation for a shoe that fits the trail running marketplace. They also run in the same price range as the Altra Instinct 3.0, making the surface preference the key difference among these two models. 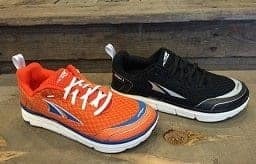 Altra has also sampled their products in the casual space with the Instinct Everday Fashion Sneaker. This sneaker comes in solid colors, making it the perfect partner piece for any attire. The suede treatment is applied on the outer shell, giving it that elegant look. The main properties utilize the same proprietary features that are found in the Instinct runners, making this a reliable fit for everyday use. This is a more fashionable look at Altra functioning. With the inclusion of responsive technology, Altra has proven they can respond, too. This new model builds on the premise of solid construction with the implementation of lightweight capability. Durability meets functioning with proprietary means that are truly ahead of their time. Each area of the shoe holds features that expand upon your running capabilities and allow you to proceed as normal. No longer do you have to adjust for component pieces as these parts cater to your style and technique. The response to the Altra Instinct 2.0 was heard loud and clear with the 3.0 model.